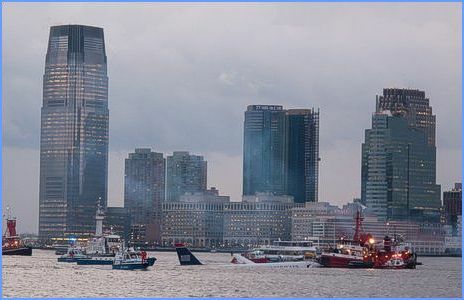 A plane crash in New York USA which involved a passenger jet crash-landing on the Hudson river has amazingly resulted in all 155 passengers and crew being rescued alive and safe. The heroic captain, Chesley Sullenberger of US Airways Airbus A320 – Flight 1549, did a fantastic job of skilfully managing to land the plane on the river and checking the aircraft twice to make sure everybody got out safely before emerging himself. What caused the plane crash in the New York Hudson river? Although there is an investigation underway the pilot reported what is termed a ‘double bird strike’ just after taking off and requested to return again before having to crash-land in the near-by river. It seems as though a large flock of birds, possibly geese, collided with the plane and went straight into both engines causing them to shut down. One bystander reported that it did not look as though the aircraft was in trouble but was wondering why it was coming in so low, next thing it landed on the water as if it was landing smoothly on a runway at the airport! The next few minutes the doors opened and people started getting out on the wings and rescue boats and ferries with emergency services rushed to the scene. There are some people with injuries probably caused as the plane hit the water but everyone is alive and all passengers and crew got out before the airbus filled with water. The New York Mayor has praised Chesley Sullenberger and the crew of the flight for the way the near disaster was handled so professionally and smoothly. 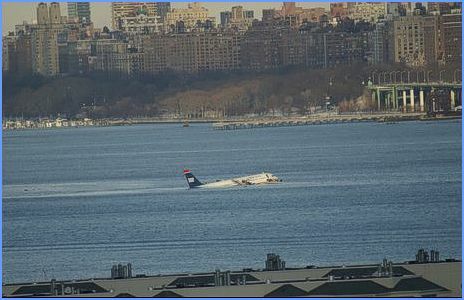 It’s great to hear of wonderful news like this and how peoples lives have been spared, it’s not every day you will see a plane land on the waters of the Hudson River New York USA!